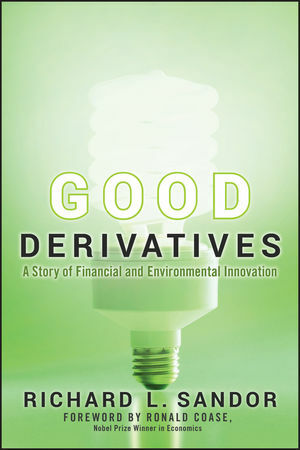 Through the eyes of an inventor of new markets, Good Derivatives: A Story of Financial and Environmental Innovation tells the story of how financial innovation – a concept that is misunderstood and under attack - has been a positive force in the last four decades. If properly designed and regulated, these “good derivatives” can open vast possibilities to address a variety of global problems. Filled with provocative ideas, fascinating stories, and valuable lessons, it will provide both an insightful interpretation of the last forty years in capital and environmental markets and a vision of world finance for the next forty years. As a young economist at the Chicago Board of Trade, Richard Sandor helped create interest rate futures, a development that revolutionized worldwide finance. Later, he pioneered the use of emissions trading to reduce acid rain, one of the most successful environmental programs ever. He will provide unique insights into the process of creating these new financial products. Covering successes and failures, the story describes the tireless process of inventing, educating and creating support for these new inventions in places like Chicago, New York, London, Paris and how it is unfolding today in Mumbai, Shanghai and Beijing. The book will tell the story of the creation of the Chicago Climate Exchange and its affiliated exchanges (European Climate Exchange, Chicago Climate Futures Exchange and Tianjin Climate Exchange, located in China). The lessons learned in these markets can play a critical role in effectively addressing global climate change and other pressing environmental issues. The author argues that market-based trading systems are a far more effective means of reducing pollutants than “command-and-control”. Environmental markets may ultimately help to find solutions to issues such as rainforest destruction, water problems and biodiversity threats. Written in an engaging, narrative style, Good Derivatives will be of interest to both practitioners and general readers who want to better understand the creative process of financial innovation. In the middle of so much distrust of markets, it is also a recipe of how transparent, well-regulated markets can be a force for good in the environmental, health, and social areas. RICHARD L. SANDOR is Chairman and Chief Executive Officer of Environmental Financial Products LLC, which specializes in inventing, designing, and developing new financial markets with a special emphasis on investment advisory services.? ?EFP was established in 1998 and was the predecessor company and incubator to the Chicago Climate Exchange (CCX), the European Climate Exchange (ECX), and the Chicago Climate Futures Exchange (CCFE). Dr. Sandor was honored by the City of Chicago for his contribution to the creation of financial futures and his universal recognition as the "father of financial futures." In October 2007, he was honored as one of Time magazine's "Heroes of the Environment" for his work as the "Father of Carbon Trading." Dr. Sandor is a Distinguished Professor of Environmental Finance at Guanghua School of Management at Peking University and a Lecturer in Law at The University of Chicago Law School.